Plenty of interest and some very good performances in this production of Othello at Stratford. Some of the effects and the choices by the Director, Iqbal Khan, worked really well, others I was less sure about. The stand out performance was from Lucian Msamati as an unrepentant Iago, whose laugh as the lights went down at the end of the play was spinechilling. 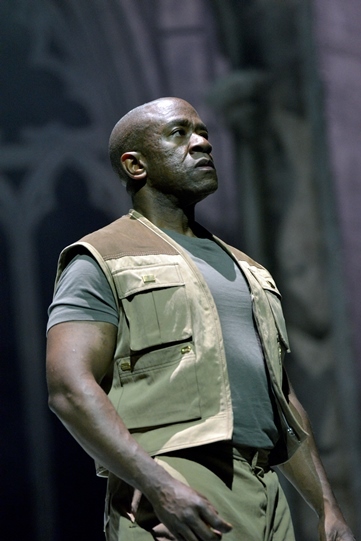 That he’s a black actor needn’t have been important – he wasn’t playing a role in which skin colour is really significant – but Khan chooses to make it important, using it almost to set the tone for the production, emphasising racist elements and changing the dynamic with Othello, and particularly with Cassio. In the scene where Iago conspires to get Cassio drunk and violent, the production seemed to move a long way away from Shakespeare, with Iago singing (beautifully) an African folk song and Cassio taking part in a rap contest, that reveals him as a closet racist. That Iago should resent his black commander promoting a less experienced and racist white man above him made some sense, but it made less sense of the position of Othello, who in a multi-racial army was no longer the outsider, himself the obvious victim of racism. It was also hard to see Othello as ‘the noble Moor’ when he’s portrayed as both complicit in torture and not above using it himself on Iago – so hardly noble, even without considering whether he’s a Moor or not. 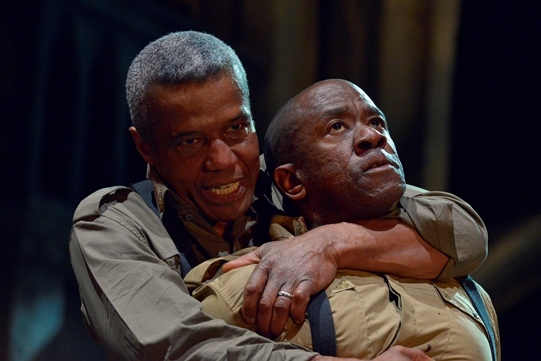 Hugh Quarshie as Othello turns suddenly to jealousy and to violence in a powerful scene that makes some sense of what is to come, but is less obviously connected to what went before. This is a sudden eruption of the green-eyed monster, not a slow-burning build up. Was violence just under the surface, coming from his background as a military commander, more than as an outsider? Iago on the other hand, is allowed to build some sympathy with the audience that makes it difficult for much of the play to see him as the personification of evil. He’s more of a good-natured rogue, closer to Sid James than the Borgias until his scheming reaches its tragic climax and that chilling laugh breaks out. Throughout though there’s little sympathy with his wife in a relationship that is put into stark contrast with the relationship between Othello and Desdemona. 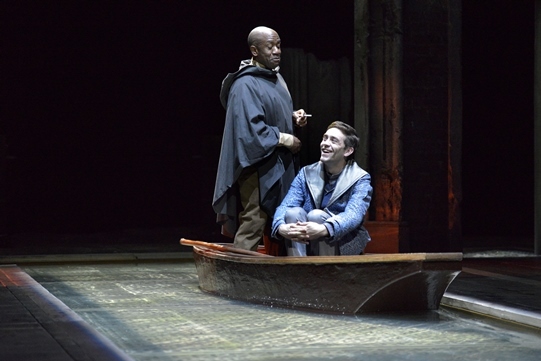 As usual, the RSC made good use of its versatile stage, here filling a central section with water, used in the first scene as a Venetian canal, and later as a bathing pool for Desdemona. A grille rose and fell to expose the water, cover it over with a platform or even double as a table. We’re used to spectacular effects in modern theatre, but I know nowhere else that’s as innovative and adaptable in its use of space as the RSC on its Stratford stage. The setting and costumes were quite difficult to pin down . Much of it appeared to be present day, with echoes of Iraq in the images of torture, faffing around with aerials to improve laptop connections, and one speech delivered as if through video-conferencing. Some of the costumes though, particularly for the women, and some of the other design elements, seemed much more traditional. But despite any small quibbles, this was a thoroughly enjoyable evening and another success for the RSC. Posted on August 18, 2015, in Theatre and tagged Hugh Quarshie, Iago, Jealousy, Lucian Msamati, Othello, Racism, RSC, Stratford. Bookmark the permalink. Leave a comment.